Each GFET is functionalized with a molecule (e.g. antibody, antigen, or nucleic acid) specific to the target, and the device electrical properties change dramatically when the binding events occur after analyte introduction. 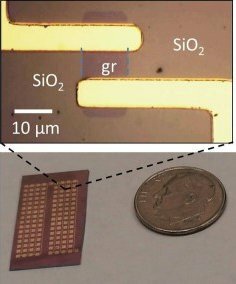 This very sensitive detection can only be possible using graphene. Those chips are consumable, by the way. The company is currently targeting two main applications: early detection of Lyme disease and cancer detection. Graphene Frontiers will first enter the research-use-only (RUO) market with a basic, customizable product. This is a limited volume market (orders may reach a few hundreds of chips), but later on they want to also enter the diagnostic and consumer health markets - which may require tens of millions of chips. In the first stage, the company aims to produce those GFET-based sensors on 4" wafers in low-volume (few wafers per day) in-house. The chip itself is about 5x5 mm in size, and will come in multiplex/array of about 10 devices. Each chip is expected to cost a "few dollars". Later in 2014 they will partner with a MEMS fab for mass-scale 4" wafer production. By 2015, they plan to be able to produce tens of millions of chips per year. In November 2013 I posted an article describing Graphene Frontier's technology and business following my talk with Michael D. Patterson, the company's CEO.